The two teams coming together to receive the trophy and take a group picture. 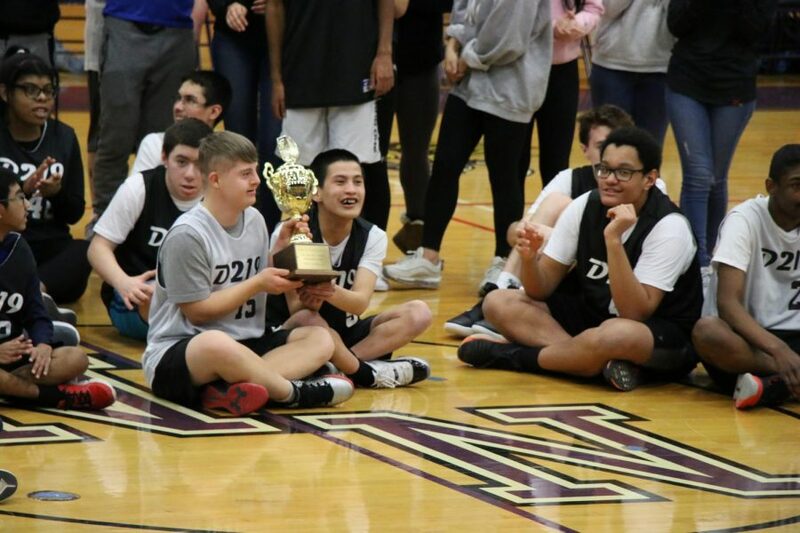 A few days ago, on Feb. 2, 2019, the annual CEC Basketball Game took place at Niles North High School. With winter sports winding down their season’s, we couldn’t forget about the most awaited event of the year. Switching off between both sister schools, the game was held at North on Saturday afternoon, for two 20-minute halves of fantastic basketball. The game started off very close in the first 10 minutes, with a score of 6-4. There was great passing, shooting, and teamwork to get some points on the board. Moving nearer to halftime, the points tripled, with the score being 20-16 at the half. Throughout the first 20 minutes, a ton went on. Everyone had the opportunity to get the ball, everyone had a shot at scoring, and it was overall great sportsmanship. With many kids participating, there was help from Niles North and Niles West students and faculty throughout the entire length of the game. Niles West special education teacher Sarah Murphy had some time to reflect on the great performance his kids put on. Along with faculty, a handful of students partook in being team coaches, aids to individual students, and referring through the competition. Of the many students, a few were extremely involved in the creation of the event and were elated with the turnout. Senior Gaby Goldman was very pleased with the effort and determination of all the players during the game. Of course, everyone involved in the event made such an impact on the players themselves. Without the guidance, encouragement, and positive energy, the players might not have had as good of an experience as they did. For junior player Piotr Litera he continued to talk about how much he loved playing with his friends and pulling out the win. “It was a lot of fun. Playing with my friends, playing in front of my family, and shooting was my favorite. My team won and I had 7 points. I can’t wait for next year,” Litera said. With the final score being 32-24, the white team came out victorious in the end. Whether they were competing to the best of their ability or striving to have a great time, this yearly celebration never fails to exceed everyone’s expectations. The win was definitely an incentive, but ultimately, the amount of fun and comradery showed throughout the contest was priceless to everyone that was involved.